The fact that the human eyes are separated by a few centimetres means that our brains are able to calculate depth in the visual scene. We are able to see the world in three dimensions (3D). 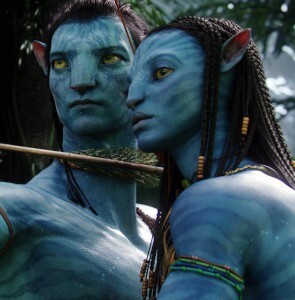 The highest grossing movie of all time, Avatar, was filmed in 3D and audiences all over the world have been entertained by the exploits of Na’vi, the blue-skinned humanoids who inhabit Pandora. Although the stereoscopic techniques used to make Avatar were considered groundbreaking, 3D movies have been in existence for almost a century. Since the human breast is a 3D structure, diagnosing cancer can be challenging if the radiologist has to rely on a two-dimensional (2D) image. When healthy and pathological structures overlap each other, cancerous lesions can be occult (i.e. hidden) if they are embedded in dense surrounding tissues. As described in a previous blog, digital breast tomosynthesis or DBT is a technique in which 10 to 12 projection views over an arc of about 30 degrees are acquired, enabling the breast to be reconstructed as multiple slices. In fact, DBT was recently recognized by AuntMinnie.com as the Hottest Clinical Procedure for the third straight year. When compared with computer tomography (CT), DBT does not have the ability to view the structures in true 3D, suggesting that there may yet be a role for breast CT, giving hope to companies like Koning and CT Imaging. In the meantime, however, Fuji has been exploring the use of conventional stereoscopic digital X-rays for the diagnosis of breast cancer. 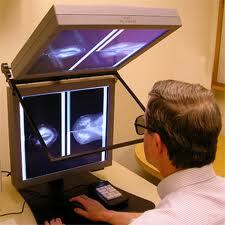 Stereoscopic mammography viewing station. Copyright RSNA. Using the Fuji system, Carl D’Orsi of Atlanta recently reported in Radiology on a study of 779 women who were identified as having a high risk of breast cancer. He noted “In this technique the X-ray tube functions as the eyeball, with two different images providing slightly different views of the internal structure of the breast”. A pair of X-ray images, shifted +5 and ‑5 degrees off centre, created the stereo pair and then a custom viewing station was created for the radiologist who wore special glasses (see photo at left). Their findings, admittedly based on a limited sample, showed that the 3D stereoscopic technique, where the radiologists could peer into the breast and look behind dense tissue, enabled them to reduce the recall rate and increase the percentage of true cancers diagnosed. What’s not clear, however, is how this 3D approach compares with DBT.